a piece [bag] of charcoal 木炭 1 個[袋]. A charcoal (charcoal drawing) of a young girl. The drawing has been charcoaled with a charcoal stick. From Middle English charcole, from charren (“to change, turn”) + cole (“coal”), from 古期英語 cierran (“to change, turn”) + col (“coal”); equivalent to char (語源 3 (verb)) +‎ coal. (countable, uncountable) Impure carbon obtained by destructive distillation of wood or other organic matter, that is to say, heating it in the absence of oxygen. 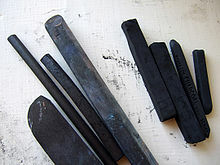 (countable) A stick of black carbon material used for drawing. He takes the prepared charcoal used by artists, brings it to a white heat, and suddenly plunges it in a bath of mercury, of which the globules instantly penetrate the pores of charcoal, and may be said to metallize it. (countable) A drawing made with charcoal. A very dark gray colour. Of a dark gray colour. Charcoal is the dark grey residue consisting of impure carbon obtained by removing water and other volatile constituents from animal and vegetation substances. 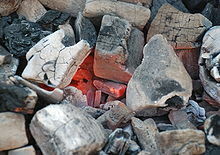 Charcoal is usually produced by slow pyrolysis, the heating of wood or other substances in the absence of oxygen (see pyrolysis, char and biochar). The resulting soft, brittle, lightweight, black, porous material resembles coal. Note that the current trade nomenclature for charcoal is "lump charcoal" and that products sold as "charcoal briquettes" are made from a mix of materials, such as low-grade coal, sawdust, wax, and starch binders, and often do not contain any true charcoal.